ARTIST SPOTLIGHT. Luther’s Dulce de Donké will have a booth on Main Street at the Luther Pecan Festival on November 17, 2018. LUTHER – Donkey milk may be an uncommon drink for most people, but for the Traywick family of Luther, it is the answer to their prayers. Their journey led them to establish the state’s first Donkey Diary! This is the beginning of the story about a Luther business spotlighted by the state’s Made In Oklahoma (MIO) marketing program. Dulce de Donké is getting some media buzz attracting attention from as far away as Switzerland. They’ve been on TV, in magazines and all over the internet. That’s the outside marketing, but Dulce also does a fine job with its own marketing. Have you liked them on Facebook and Instagram? Check it out for the pictures, the antics and the sermonettes that will inspire, encourage and remind us hard work is worth it, from shoveling donkey poop to early morning milking. Many of us around here know the Traywick family. If we’ve not tasted a sample of the donkey milk, a growing number of us have tried the products – including the “Better Than Botox” moisturizer in the clever packaging. The story continues from their article from the Oklahoma Department of Agriculture and Made In Oklahoma news release shared statewide … In 2014, their 6-year-old daughter became sick with a common case of strep throat, which caused an autoimmune disease that attacked her brain, called PANDAS. With daunting medical options offered of hospitalization for IV immunoglobulin treatments or daily antibiotics for 12 years, the Traywicks were reluctant. So began a mission for a more holistic remedy. Ask Saundra whether she ever dreamed her Mama Mission would lead to donkey milk and she might laugh. They share their knowledge and donkey milk with other parents of sick children. It’s still somewhat of a fringe remedy but parents of sick children find each other via social media and the internet; they gather their own empirical data. The Traywicks sell donkey milk, and with the excess, make beautiful products (Also a throwback to antiquity, you’ve heard of Cleopatra, and her beauty regimen that included donkey milk baths!). Saundra Traywick recently appeared at West Elm in Tulsa with the Dulce de Donke line. Photo from Instagram. The Traywicks stepped tentatively into bringing donkeys to their small farm south of Luther. First one, two then three. Then their jennies started having babies, providing more milk. Today, they have 14 American Mammoth donkeys cared for by the whole family. American Mammoth’s are a breed brought to North America by President George Washington in the 1700s. Today this breed’s population is described as critical. 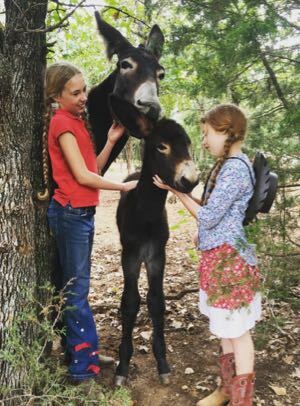 “We use the donkey milk that our daughter and other sick children don’t drink to make our line of organic donkey milk soaps and skincare that we sell on our website and through select retailers,” Saundra Traywick said. The products are available in Luther at Urban Sixty-Six on Main Street and at the Luther Pecan Festival. 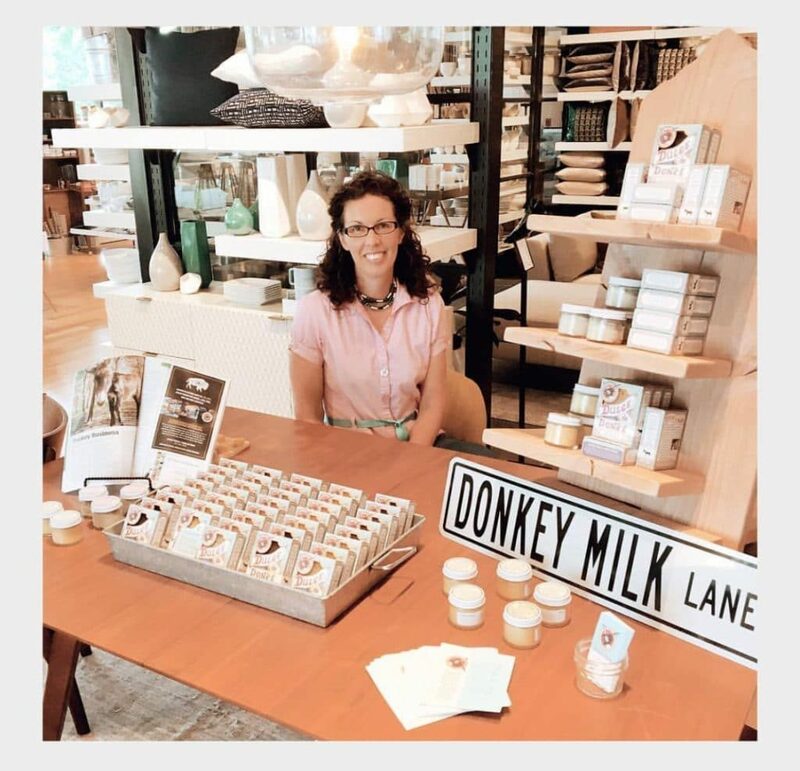 Using donkey milk for skin care is known for its anti-aging abilities and can heal eczema and psoriasis, Traywick said. 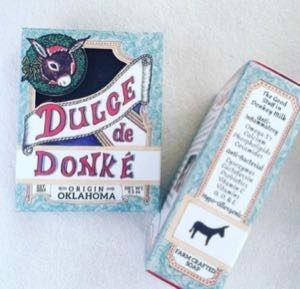 Dulce de Donké offers organic donkey milk soap, all-natural and aluminum-free deodorant, moisturizer, and a leave-in organic conditioning balm. Traywick said consuming donkey milk helps kids who can’t drink cow or soy milk, and it helps with other ailments like her daughter faced. It has also been prescribed to help everything from asthma to cancer, and although it is rarely used in the US, it is very common in other countries, she said. 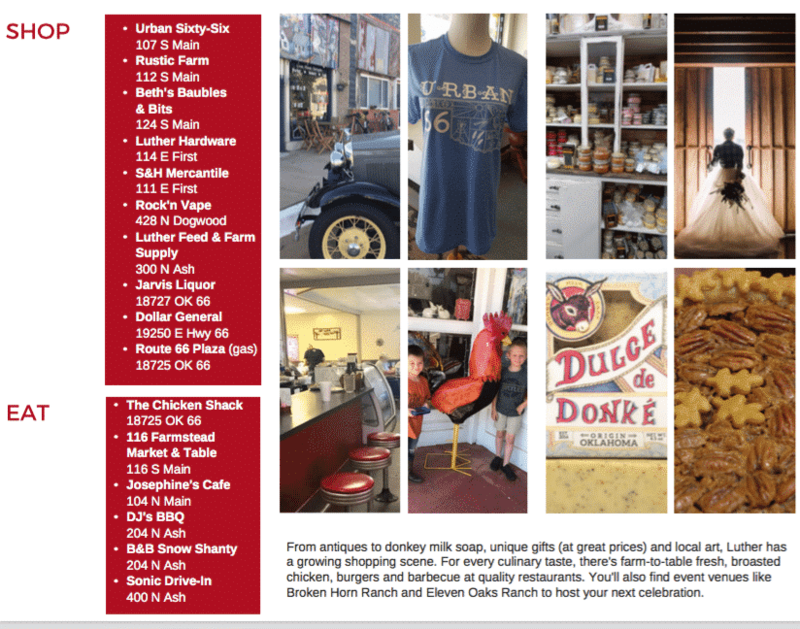 Dulce de Donke products are featured in the new SHOP, EAT, EXPLORE brochure promoting Luther and found at Luther retailers and local tourist spots like the Arcadia Round Barn. 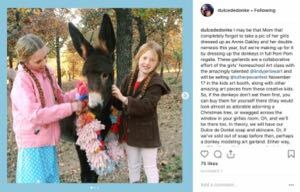 Dulce de Donké has been in operation since 2014 and joined the Made in Oklahoma Program this year. To find other retailers in addition to Urban Sixty-Six in Luther who carry Dulce de Donké products, visit madeinoklahoma.net/products/dulce-de-donke or order products at www.dulcededonke.com.